The experience was unique on my last trip home. The plane ride was bouncy and rough. I stretched out on the seat beside me in that 10-passenger small plane. Suddenly, the plane stopped. Unable to see the surroundings, I had no idea we had landed. The change of the engine sound was because we were on the ground already. Please make me feel good and tell me you did something silly like that, too. You assumed the worst when it was the best instead. I don’t feel too bad, though. The disciples did something similarly as related in Matthew 8:23-26. Then he got into the boat and his disciples followed him. 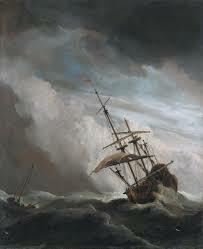 Without warning, a furious storm came up on the lake, so that the waves swept over the boat. But Jesus was sleeping. The disciples went and woke him, saying, and “Lord, save us! We’re going to drown!” He replied, “You of little faith, why are you so afraid?” Then he got up and rebuked the winds and the waves, and it was completely calm. Father, forgive me when I lose my faith and doubt that you’re in my boat, present during my storms. Grant me wisdom and conviction to know I’m never alone, to be calm when the winds of disappointment, of heartache and fear blow fiercely around me. I will count on the safety of your presence in the storms of all sizes. In Jesus’ name, amen. What storms are you facing today? Who’s in your boat.